Bomberman in Super Bomberman R.
Bomberman (ボンバーマン, Bomberman), oftentimes referred to as White Bomberman, is the main protagonist of the Bomberman series. 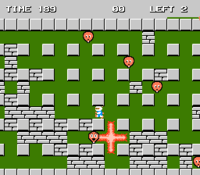 A bomb set by Bomberman explodes in a cross pattern in Bomberman's NES release. White Bomberman is the primary representative of the Bomberman people, the dominant inhabitants of Planet Bomber. Like the other Bombermen, he has the ability to create bombs. There are many incarnations of him represented in the different games of the series, which do not usually keep a particularly consistent description of the character. Generally, he is seen saving his home planet, the galaxy, or even the universe from disaster. In his home series, the Bombermen battle by setting bombs which then explode into cross patterns. These can not only attack opponents, but also break barriers and crates which contain powerups. They can also get caught in the blast themselves. Bomberman about to detonate one of his Remote Bombs on Pilotwings. Bomberman appears as an Assist Trophy character in Ultimate and lays down bombs which he then explodes into cross patterns, similar to his home game. This deals moderate damage to opponents. Bomberman can be KO'd by opponents and even his own bombs, although he avoids the latter most of the time. He may also place Remote Bombs, which he can detonate at any time. They also explode if caught in another Bomb’s explosion. Bomberman appears as a primary spirit in Ultimate. He also appears in a spirit battle against a Toon Link on Wrecking Crew's Battlefield form, likely due to the bombs on said stage. During his battle, explosive items and hostile Assist Trophy Bombermen will appear while Toon Link's fire and explosion attacks are more powerful. Bomberman's official artwork from Super Smash Bros. Ultimate. Bomberman laying bombs on Temple. Bomberman's bomb detonating with King Dedede and Pit caught in the blast. Bomberman placing a Remote Bomb. Bomberman and Young Link placing bombs on Temple. Bomberman caught in the blast of his own bomb on Mario Galaxy. He appeared alongside Wario in Wario Blast: Featuring Bomberman! for the original Game Boy. He made several cameos in the German Club Nintendo comics interacting with other characters in the Mario series such as T.T. from Diddy Kong Racing and Mario himself. He appeared alongside Snake and Simon Belmont in DreamMix TV World Fighters, and later again in a special update for Super Bomberman R.
This page was last edited on March 25, 2019, at 12:27.